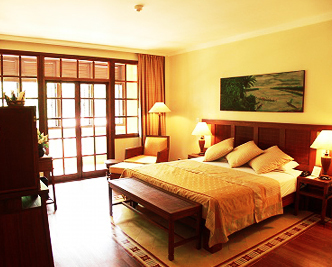 The building’s graceful colonial architecture of the 1930’s provides a sense of peaceful tranquility. The Hotel has been designated to be in total harmony with its natural surroundings and is enchantingly situated in the heart of Siem Reap, opposite the Royal Park. The Hotel is located within close proximity to World Heritage listed Angkor Temples, the quaint old market town of Siem reap and only 7 km from the International Airport. An affordable 3-day package offer! This is an annual event here in Siem Reap so that is why we encourage our guests to book early. *If you wish to extend your stay, kindly contact us. *If you wish to have 3 people in the room, kindly contact us. During this special promotion period, additional guests are at USD 10 each. *Kindly note that changes may occur with or without prior notice. Victoria Angkor Hotel in larger map.